Three dimensions of the Washington State rejection of carbon taxation (I-732 and I-6131) come to mind: practical, moral and educational. In practical terms, these measures would have only marginally impacted overall carbon emissions, and a tokenist orientation has been consistently followed by mainstream “environmental” organizations whose decades of “stand-up” and march “actions” have effectively accomplished no tangible legislation substantively reducing such emissions. Practical considerations can also explain superficially inconsistent stances by oil companies: Exxon CEO Tillerson publicly supporting a carbon tax, essentially “no comment” from oil firms on I-732, and millions poured into ‘No on I-1631.’ A revenue-neutral carbon tax has relative appeal to the oil industry because it hits coal companies harder, is relatively transparent and easy to plan around, and competes (at least ideologically) with carbon reduction through regulation. I-732 had most of those features. By hand-picking recipients of revenues, I-1632 promoted a kind of fiscal beauty contest oil companies might not do well in. From a moral perspective, our generations now are -in a geological twinkling of an eye- knowingly spending the “natural capital” of carbon stored away for millions of years, returning that carbon to oceans, biosphere and atmosphere where it profoundly alters the long term global climate, leaving many future generations the legacy of a probably poorer and riskier “Anthropocene” global economy. And that great one-off generational transfer is being widely excused through deliberate denial of basic science. I believe Washington State citizens and leaders deserve favorable recognition for at least attempting actual carbon pricing legislation, a relatively rare public issue especially in the USA. Unfortunately, when token and log-rolling approaches (from the 2009 national cap-and-trade proposal to the most recent Pacific Northwest attempt) are rejected politically, this amounts to lost opportunities on an issue where time works against us. Open-ended launching of ad-hoc trial balloons carries a stiff price. Every year’s delay in adjusting the carbon price to a morally justifiable higher level means more CO2 in the air, and drastic alteration of the global climate, lasting centuries to come. Under “basics/what to do with the carbon revenue,” CTC observed last June (correctly I’d say) that a “political center” for “carbon dividend” proposals barely exists. My suggested response: more public education on why such proposals deserve support. Let political interests with other agendas (whether greater or lesser regulation, increased or decreased subsidies for non-carbon energy and energy efficiency, or feel-good symbolism) pursue their aims through separate endeavors (preferably) or by integrating them into carbon tax bills (acceptable as a last resort). In my view, advocates for revenue neutral Pigovian taxes on carbon need not hold back from making their case as directly as possible, and helping inform the public of the many cogent supporting arguments behind it. Redistributive refund arrangements seem advisable, as might some kind of international tariff scheme, but a higher priority ought to be enacting revenue neutral carbon taxes themselves. The revenue-neutral approach is working in Canada and elsewhere, while attempts in the United States to package it with other agendas have been confusing voters and going down to defeat. A better educated public will be more easily able to perceive the value of a carbon tax in its own right. At this point, I see no better educational source than CTC itself. Thanks and please hang in there! I support Drew Keeling’s call for a “clean” carbon tax: one that is revenue-neutral, with no new expenditures of dubious merit and no new and controversial bureaucracy to prioritize them. Alas, I do not expect Washington state’s proponents of I-1631, SB 6203 or I-1732, enamored far more of their new pet programs than of economics, to bring this to the voters. I’d like to echo some of the previous comments, plus add a plug for the tax swap concept based partly on the public aversion toward taxes to be replaced or reduced. I really agree that “Washington State citizens and leaders deserve favorable recognition for at least attempting actual carbon pricing legislation.” We all understand that reductions in carbon emissions in Washington would have a negligible effect on climate change. This was always about setting an example, responsibility, and the experiment. So thanks. We have learned a few things, we hope. I-732 taught us that a segment of the left is not primarily interested in the price of carbon. Rather, the use of tax revenues to fund specific programs, being their favored approaches, and the ability to fund their vision of equity through their established territories appear to be priorities. I agree that, in the context of decision and technological lags that we face, fast action is needed to implement carbon-reducing technologies and programs that could be funded with the carbon tax. However, the result for I-1631 shows that a large segment of the public does not trust their government to spend the revenues wisely. 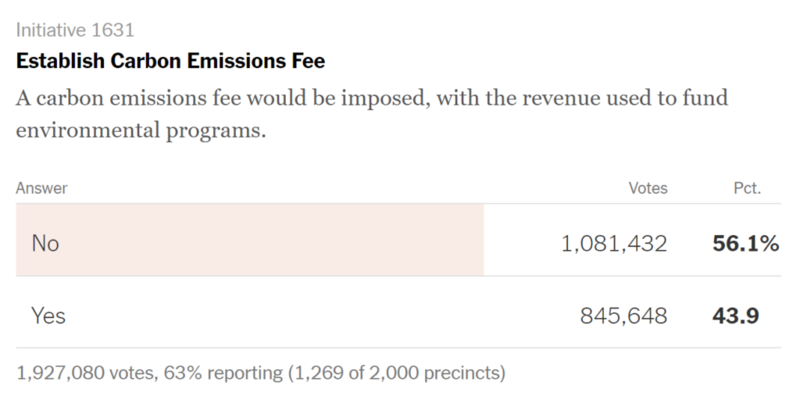 People understand that I-1631 (and perhaps the “Green New Deal”) are tax and spending proposals. Most people, even in Washington State, do not approve. Looking ahead, such schemes, regardless of their true merits, could undermine the credibility of the Democratic party heading into the crucial 2020 elections. I hope the results of I-732 and I-1631 have taught an important lesson about a bird in hand. I-732 also showed that the inefficiency and inequity of taxes to be replaced can be a powerful argument for a tax swap. The reduced sales tax and B&O tax on manufacturers were strong selling points. State sales taxes are regressive and voters knew that. With a few adjustments that are now better understood, sales tax reduction with relatively minor targeted payments can be used to offset the regressive effects of a carbon tax. I-732 won almost 41 percent of votes without the support of either major party or most major environmental groups. If some of these interests had not placed their politics ahead of carbon reduction perhaps Washington would now be the experiment for other states and the nation to learn from. I-732 taught us that one of the strongest arguments for a true tax swap could be the unpopularity of taxes to be replaced or reduced. Who likes the income tax? Taxes on earned income reduce the incentive to work, and by substitution, increase the incentive to burn fossil fuels. At the federal level, the bottom 50 percent of taxpayers recently paid about $30 billion or less than 3 percent of personal income taxes. . A carbon tax swap could easily be used to eliminate income taxes for half of those who currently pay. That could win some votes. A federal carbon tax could also be used to fund sales tax reductions in states that have sales taxes. Most generally, targeting the tax reduction to those viewed as most odious could be part of the winning plan. I believe that the greatest impediment to carbon tax swaps for voters is the transparency of the swap. People simply do not believe that their government will make good on their promise of neutrality. That is why the “tax and dividend” proposals have some traction. The true administrative costs of such a plan, plus the potential for gaming the payments and outright fraud, are currently underestimated, in my opinion. The one thing we have learned by now is that carbon taxes are going to be a hard sell in any form. Big money is waiting to attack any proposal. There will be great and justified pressures to reduce budget deficits and increase spending for programs that have demonstrated carbon-reducing benefits. Proposals will need to simply and clearly track revenues, disbursements and program costs. We do not need an ACA of carbon taxing and spending. Finally, the tax swap should be an important part of carbon tax proposals. The major environmental groups and the Democratic party should accept the lessons from Washington State and embrace that idea.